We all hear about shale gas being the next big thing in energy, but what is it? The quick retort is that it’s gas in shale, but what does that mean? The gas is a natural gas so it is a series of hydrogen and carbon linked in gaseous forms. This includes gases like methane and ethane, but what about the shale? 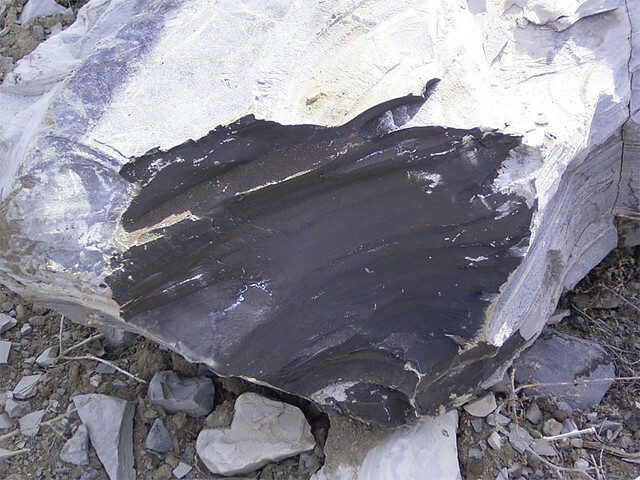 Shale is a type of rock with a low permeability mix of mud, clay, and other minerals such as quartz. If natural gas hits a shale layer as it migrates to the surface, it can become trapped in the shale. A shale play is an area where shale gas is being produced or where companies are looking for shale gas. The shale plays are located through out North America. The Marcellus play covers 600 miles throughout the Appalachian Basin. It ranges from New York, through West Virginia, and down to Tennessee and could contain 500 trillion cubic feet of natural gas (about the energy equivalent of 83 billion barrels of oil). The Barnett shale formation is in north central Texas. It spans from Montague to Hamilton and Jones to Dallas Counties, with one of the major concentrations located in Tarrant County. The Barnett may hold 30 trillion cubic feet of natural gas. Shale gas is considered an unconventional resource which means that to extract the gas there needs to be more done than simply putting in a vertical well. To get the best bang for the buck, you need to drill through the shale formation horizontally and then add force and pressure to break up the shale. Shale gas is a great example of how new technology and a new way of looking at old things can bring about great change. Shale gas wells have been in production since the 1820’s, but because it was too expensive to remove the gas from the shale, we let it lie. Because of the properties of shale, production of shale gas wells remained extremely low up to the begging of the 21st Century. By then technology and economics had caught up with the resource. Natural gas is mainly used to create electricity and heat. In colder climes, the use of natural gas to create heat varies inversely with the outside temperature (as it gets colder more gas is used to make the inside of my house warmer). The natural gas used in power generation has consistently gone up every year. Natural gas also burns much cleaner than coal. From 2000 to 2009, gas from shale went from 1% of the total gas production in the United States to 14%. That’s a huge jump in just a few years. In 2005 the United States imported 15% of the natural gas it consumed. It had been predicted that by 2030 we would increase imports to 20%, but because we knew where to find the shale gas, the necessary technology matured, and the economics came into line, by 2030 we should be importing only 1% of the natural gas we use. In fact there is enough gas in all the different plays to last us 150 years at 2009 consumption rates. With any new technology there are always concerns that it could negatively affect the environment. The largest concerns come from the way the shale formation is broken up in the well. Hydraulic fracturing, commonly called fracking (not be confused with other types of frack, is a process that uses a solution almost entirely of water which applies pressure to the rock and causes it to break. If you have paid any attention to the news, you’ve probably heard of some controversy over fracking. There are concerns that fracturing the shale formations is allowing the groundwater to become contaminated. Some water wells and groundwater that are near shale gas wells have become contaminated with gas and other chemicals that are used in the shale gas well. This, however, seems to come from improper well completion, spills on the surface, and evaporation of hydraulic fracture fluid that was open to the environment. None of this contamination comes from the fracking. Shale gas occurs well below ground water and aquifers. An aquifer may run down as much as 600 ft or more, but the shale gas is another mile or more below that. However the EPA is currently conducting tests on different wells, both gas and water, to see what is really going on. Their report is scheduled to be out at the end of the year. Another concern is the amount of water it takes to frack a well. It can take up to 5 million gallons of water to finish one well. If the well has poor access to local water, then the water will have to be trucked in from elsewhere. Should we allow the fields of this resource to lay fallow? Should we rush in and irresponsibly develop the resource? The answer to both is “no”. It is an energy source that we will need to maintain and improve our lives, but we should be mindful and develop it responsibly. As we harvest the plays, we must make sure that we are not creating even more problems down the road. Shale gas will play an important role in our energy, environmental and political future. Previous Post The Emancipation Proclamation is coming to a museum near you. Next Post Come Party at the Museum with Party Smarty!